The success of dental implants is based on the theory of OSSEOINTEGRATION or the ability of the implant to "integrate" into the bone ("osseo" is Latin meaning "bone"). 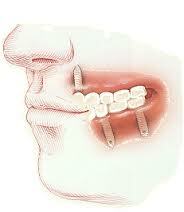 This allows for the bone to grow to the side of the dental implant. When the implant has healed, the dental implant will be fully integrated into the jawbone. The success rate for this type of dental implant is well over 90%. The success rate for the lower jaw is slightly higher than the rate for the upper jaw, because of the density of the bone. The success of the implant is also dependent on the restoration which is placed by your general dentist. The care and cleaning of your dental implant is left up to you. The procedure for implant placement involves putting the implant into the bone and covering it over with tissue for at least 4 to 6 months ( based on location). This allows the bone to heal directly to the implant. At the end of 4 to 6 months, you will return to our office and the implant will be uncovered. When this is done, a small healing collar is placed into the solid implant. You will then return to your general dentist's office and he will complete the restorative work (denture, bridge, crown, etc.). There is a possibility that the implant will be uncovered at the time of placement. This is based on the instant stability of the implant. If that is the case, the implant will have a healing collar in place to prevent the soft tissue from covering the implant. It is critical that the patient be very careful not to place the exposed implant under stress by chewing on it. The success rate of dental implants is over 90%, which means that less than 10% fail. Failure can be the result of many factors. However, if the implants do indeed fail, they are removed and the bone is allowed to heal for a few months. After the healing is complete,a new implant can be placed in the same area. We are very excited about the opportunities available with dental implants. They greatly increase the options for your general dentist and the work he or she needs to do to restore your teeth. We think you have made an excellent choice. Congratulations!